Mexico, MO (May 2011) -- Fluctuating silver prices have people paying close attention to the time they sell silver items such as silver oxide batteries. Since the beginning of 2011, silver prices have steadily climbed to more than $30 USD per troy ounce, increasing the demand for silver refining and recycling services. Recycling materials high in silver, including silver oxide batteries, offer cash returns and positive environmental advantages. Arch Enterprises refines silver oxide batteries from watches, hearing aids, camera, calculators and other small electronic devices. The precious metal refining company has increased operations in their refinery to handle the demand for silver material. Arch also gives special large volume pricing to those that have more than 35 pounds of the material. "To keep up with the demand of our customers wanting to sell silver watch batteries, Arch has opened a second rotary furnace for silver and has them running for longer spans of time in the business day," said Stacy Slater, national sales manager for Arch Enterprises. "We have jewelers, battery stores and others who have saved these silver batteries and have decided to cash in with silver prices being so high. We know it is important to our customers to receive their expected silver price with a turnaround time of 3-5 business days." 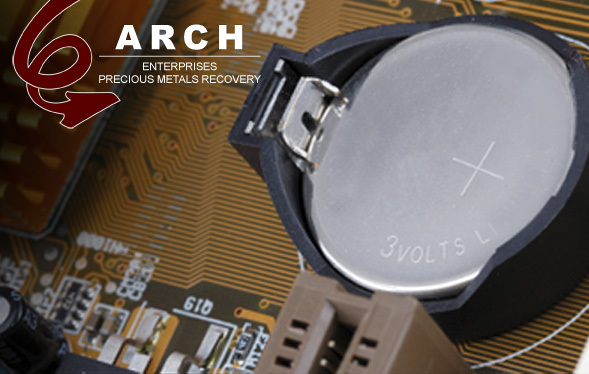 Arch Enterprises encourages people to recycle silver batteries, not only for the cash return but also because it is beneficial to the environment. When these types of batteries end up in landfills, they often leak chemicals into the ground. Additionally, the silver contained in them is never recovered and as a nonrenewable natural resource, it is best for the silver to go back to medical, electronic and other industries that utilize silver. Due to the increased volume of silver batteries, Arch requests a minimum of five pounds of sorted batteries. "We have been refining silver for more than 15 years. Arch uses proven refining techniques that have been formulated specifically for our refining facility and equipment. We can handle everything from small, five pound volumes of batteries from mom and pop jewelry stores, to gallon drums from large scale manufacturing companies. We give fair returns to our customers based on the price of silver and recycle byproduct material in an environmentally friendly manner," said Slater. Arch Enterprises maintains an A+ rating by the Better Business Bureau and is affiliated with several professional associations including the National Association for Information Destruction (NAID) and the National Association of Dental Laboratories (NADL). The company provides silver oxide battery refining services nationwide and can help arrange freight for large shipments. More information about silver oxide battery refining estimates can be requested by calling 1-800-835-0478 or by visiting http://www.archenterprises.com. Arch Enterprises is one of the nation's leading precious metal refineries. Located in the heart of Missouri, Arch Enterprises became incorporated in 1997 and provides recovery services for all scrap precious metal materials including gold, platinum, silver, palladium, rhodium, iridium and ruthenium. Arch Enterprises performs extraction services for the photo, medical, dental and jewelry industries but also works with consumers on a regular basis to recover metals from old coins, flatware, jewelry and other decorative pieces. Chemical manufacturing and plating companies also rely on Arch Enterprises, as one of few precious metal refineries in the U.S. that offers recycling services for metal-containing chemical catalysts. For more information about Arch Enterprises or to receive a quote for metal refining services, visit www.archenterprises.com or call 1-800-835-0478.